Yesterday started by a visit to the dentist, I tried the test plate for size, and it felt great, I was pleased with the tooth colour match. Times change, no more putting your teeth in a glass at the side of your bed! The Dentist laughed when I asked her, she is only 25, so maybe such things are in museums now, but because the plate is flexible, and will stay put, you only take it out to clean it, otherwise it is a permanent fixture...sounds OK to me! I will get the final plate next Saturday. We then went on to the Commercial Centre to visit the Mobile Phone Service Provider, Claro, I decided that I will buy a data packet each month, but when I tried to do this on line, it told me that I haven't got a phone assigned to my number, how the hell I have been making calls and them taking my credit I have no idea! Anyway it turns out it was a glitch, and I have to make the purchase by sending a number by text, which the man did for me. £12.90 for 30 days or 2Gb doesn't seem bad to me, I doubt I will use the full allowance, if I don't make good use of it, I just won't buy it again. Then it was time to start the family day out! So off to Maria Elena's, to collect her, Sandra and Sebastian, firstly we walked up the road and had lunch, then back to the car and off to 'Afterland Parque Temático', we thought it was something similar to DiverCity, which was great for kids. It didn't start off too well, we couldn't find the Commercial Center El Tesoro, in the end, Marcela used the GPS on her mobile. We walked into Afterland, I was all for doing an about turn and leaving again, it is advertised (they only have a FaceBook page, the above link gives the address and contact details) as a theme park for all ages...they are kidding! It takes up just about the entire top floor of the Commercial Center, and is a dank depressing warehouse, with activities, there are not that many of those, a large space is taken up by a Restaurant, and Kids party rooms, for private functions. The floor is bare concrete, and to be honest I can't think of anything in it's favour. Unless you took at least two children, it could be a very lonely time for them, as most of the activities needed more than one to make it work. 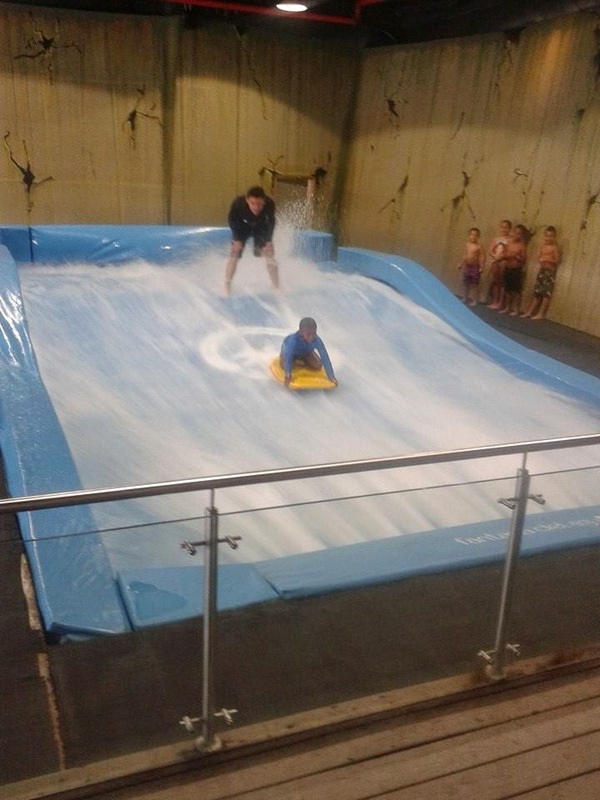 he enjoyed this, a member of staff is there to help, you kneel on a surfboard they turn the water on, and wheeeeeee... off you go, or not, as the case may be, you are advised to take a change of clothing for this, and it was just as well Sebastian had just that. 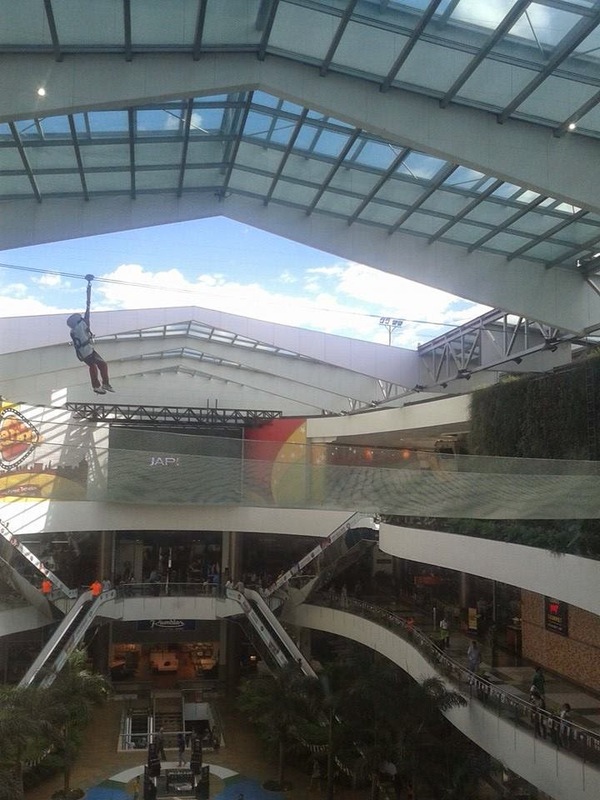 A zip wire, that took the kids in sections around the whole building, which looked fun, I'm not sure about the bit where you passed out of one side of the building, across the Shopping Mall, with people walking two storeys below, and back in the other side (there is a safety net just in case). An ice hockey rink, without the ice, helmets and pads provided, on our arrival, there was one lad on his own, pushing a puck around the rink...great fun, Sebastian had a go at this later, when there were three others to play with! There were a couple of other activities, including high wire assault course and a laser shooting gallery, the latter had a long waiting time, because there were birthday parties booked in first, so that was given a miss. Marcela stated the theme for Afterland, is the end of the world, I have to give them their due, it felt like the end of the world, I have never been so bored!!! I went off for a walk around the Commercial Center, very nice, but I now realise why we have never been there before, the prices!!!! being in the affluent area of Medellin, it is targeting those with cash, if you haven't got it, don't bother going there to shop! It was 5.30pm when we came to leave, so we went for a Burger first, and then headed home, dropping the family off on route. As we pulled up outside in the dark, I could see that the soil banking, had been messed up, but all the plants seemed intact, we had a look, and it was obviously kids. 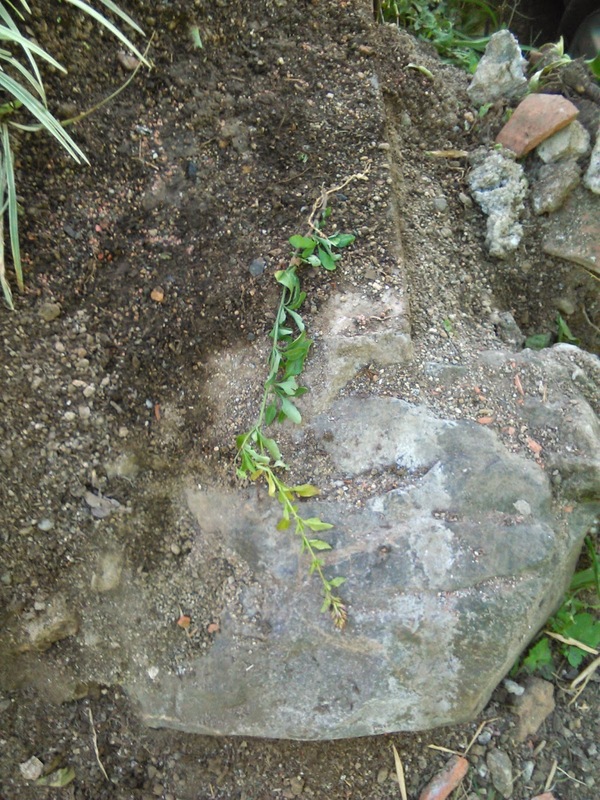 I went out this morning after my walk with Pépe, and tidied up, whilst doing so found this, as well as a couple of other broken stems, but still attached to the plants. It looks as if I am going to have to do something else to protect the plants, a temporary cage of barbed wire may be the final solution at the top of the bank, there is no reason for anyone to be there, so anyone injured would be their fault. I'll have to give that some thought. As for the rest of today, at the moment, no plans, so may well do some gardening!